Barber is the pickup of the week this week, as he is now the lone back for the injury-riddled Bears. With the way QB Caleb Hanie is throwing, look for Barber to be getting plenty of carries. Starter Kevin Smith’s ankle is looking iffy, potentially opening the door for the pass-catching Morris. Morris is capable of easily getting 120-130 total yards, but touchdowns have been the problem though. Tate has scored two of his three touchdowns on the year in the past two weeks, which is a positive sign. However, his yardage totals remain alarmingly low. Keep him on the radar this week. Schilens may be a good play depending on the status of both Denarius Moore and Jacoby Ford. If they aren’t able to go, Schilens looks like a guarantee for at least 70-80 yards and a possible score. Keep an eye out on the injury reports. Thomas is coming off of a spectacular week of four catches for 144 yards and two touchdowns. Thomas has all the skill to be a perennial fantasy play, but with Tim Tebow at QB, he’s always a risk. Tebow rarely throws over a single touchdown per game, so I recommend you keep Thomas on your radar before hurrying him into your fantasy lineup. Floyd has now reached 100+ yards in three of his last four games, including two touchdowns. He is possibly the best WR pickup of the week off the wire. We just have to hope QB Philip Rivers keeps throwing like he did on Monday night. Last season: The Bears finished last season far above expectations, losing to the rival/Super Bowl champion Green Bay Packers in the NFC Championship game. I can recall pundits predicting the Bears to win between four and seven games last season, finishing below the Detroit Lions and Minnesota Vikings. The Bears, however, proved the doubters wrong and finished with a solid 11-5 record. But will a virtually better team repeat that record? The Offense: Things are still looking bleak for the Bears’ passing game. Quarterback Jay Cutler was sacked 52 times last year, and management did little to improve the line to a sufficient level. Center Chris Spencer and right tackle Gabe Carimi (2011 first round pick) are upgrades over their formers, but what about the rest of the line? Cutler’s blind side has 2010 seventh rounder Jamarcus Webb and 2008 first rounder Chris Williams guarding it. Both are relatively slow and less-than-stellar at what they do, which means trouble once more. The Bears might get a little more blocking support at the tight end position, where 260 pound Kellen Davis takes the reigns away from the pass-catching Greg Olsen, who was shipped to Carolina. Offensive coordinator Mike Martz will need to continue running more run plays to keep the opposing defense honest and keep the pressure off of Cutler throughout the season. Martz needs to utilize the offensive line as the aggressors, because they sure don’t have the lateral quickness to be dropping back and defending the quarterback. Former Dallas Cowboy Marion Barber looks to take place where Chester Taylor left off: goal-line duty. Taylor was somewhat of a disappointment, but in reality, I don’t think he was meant for the role. Barber is a big body, who will run over anything that touches him. We all remember this play, right? Starting running back Matt Forte will likely be the team’s best offensive weapon once again. Forte is lethal on the ground as well as through the air. It’s scary to think that he has only scored three touchdowns at the goal line in 28 attempts over the past two seasons, but still managed to find the endzone nine times all of last season. Can we say underrated? The receiving corps looks meek, as usual. Number one target Roy Williams won’t scare away any opposing corners and neither will Devin Hester. It will most likely be Johnny Knox and Earl Bennett doing the brunt of the damage to teams second, third, and fourth string cornerbacks. Forte will continue his great play in the backfield once again. Look for him to snag a bunch of catches once more, as Cutler will likely not have enough time to find an open receiver. Yes, the Bears acquired wideout Roy Williams, but I think Bennett will be the Bears’ best receiver this season. Cutler and Bennett have an affinity for each other, and it will shine brightly this season. Unfortunately, what is thought of as the Bears’ biggest signing will end up as one of their worst. Williams will likely never repeat his 2006 campaign which included 82 catches for 1,310 yards and 7 touchdowns, even with Mike Martz. Williams drops balls at an alarming rate, which won’t bode well with the fans. He also isn’t the most durable guy out there, so expect for him to miss a few games as well. The Defense: Although weak in the secondary, the Bears are downright scary in the box. Management has done a terrific job of creating a ton of depth at the defensive line position to help out the Bears’ questionable corners. Julius Peppers and Israel Idonije teamed up for 16 sacks (eight each) last season, and that was with even less depth. Now the Bears have a fully-healthy Corey Wootton to clean up Peppers’ and Idonije’s mess. Don’t forget that they also drafted big Stephen Paea in the second round, who may or may not make an impact due to all the depth at the position. Also joining the tackles is former Texan first rounder Amobi Okoye. Okoye is a rare breed of human, as he went to Louisville at 15 years old and got drafted at 20. He’s in his fourth year in the league and is about the same age as most rookies and second year players. I think he can still mature into an even better lineman. 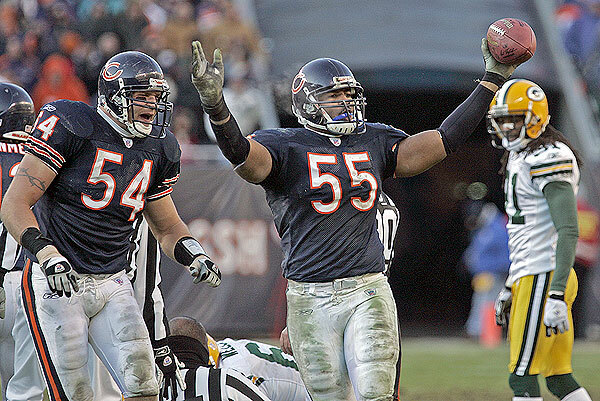 Brian Urlacher and Lance Briggs are becoming alarmingly older (Briggs is 30 and Urlacher 33), but both still have the wheels to create havoc for the opposing offense. Both of their quickness really benefits the rest of the defense and really complements the zone defense employed by defensive coordinator Rod Marinelli. Strong side linebacker Nick Roach can also fly and subtly play a bigger role than you think. Besides cornerback Charles Tillman, the corners are young and inexperienced. 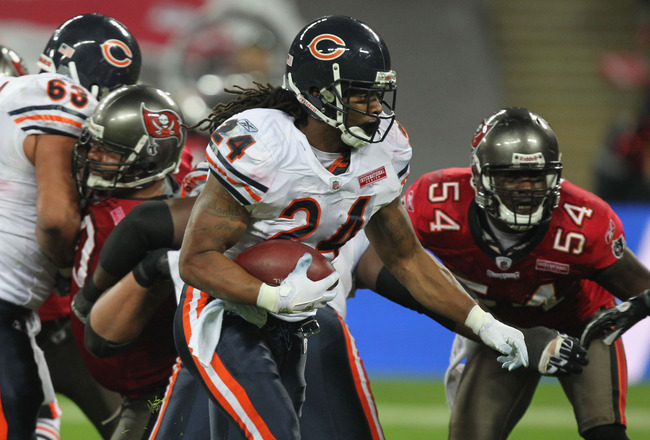 Tim Jennings heads the opposing side, but he will need some safety help in the Bears’ Tampa Two defense. Behind him is Corey Graham, the young Zackary Bowman and D.J. Moore. Hard-hitting safety Chris Harris and Major Wright look to create turnovers if they don’t get frozen. Harris will be solid, but as stated below, I’m not sure whether Wright will live up to expectations. He hasn’t boded well in the preseason, which leads me to believe he will be replaced by former Patriot Brandon Meriweather shortly. Not much to say here… Peppers is a team-changing player as evidenced by his play last year. As long as he stays healthy and determined, the Bears defense will look great. The Northwestern product should thrive whenever he gets a chance on the field. Julius Peppers will create double teams, allowing Wootton to rack up tackles and sacks. Israel Idonije benefitted from the Peppers effect, and so will the more talented and youthful Wootton. Major Wright isn’t looking like a what the Bears’ faithful have expected. Yes, he has had limited playing time in the regular season play, but he has been looking downright awful in the preseason. I expect new safety Brandon Meriweather to replace him by week 3. It hurts to say, but I believe that the Lions will finally surpass the Bears this year and vie for their first playoff berth since 1999. The offensive line will kill us once again this year due to all the talent at the defensive line position in the division. It’ll be hard to reproduce last year’s record, unless there are a bunch of injuries to key players in the NFC North. This is the NFL however, so anything can happen. For all I know, the Bears can end up going 16-0. This is an unpredictable sport.